BJP, which is leading in opinion polls, is offering giveaways to stave off a challenge from Congress, led by Rahul Gandhi. Prime Minister Narendra Modi’s ruling Bharatiya Janata Party pledged to spend $1.44 trillion on infrastructure to boost the economy and raise living standards, in a bid to match its main rival’s populist promises. 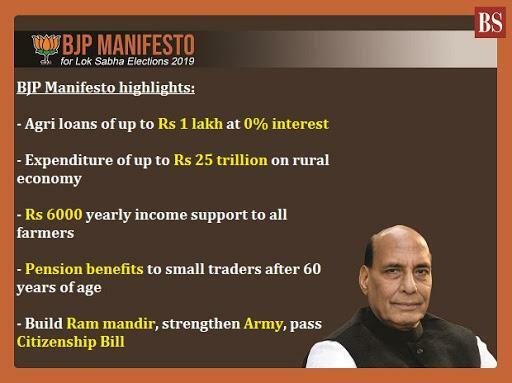 The BJP, which is seeking a retain power in elections starting April 11, released its manifesto in New Delhi on Monday, reiterating its pledge to double farmer’s income by 2022, improve the GDP share from the manufacturing sector and double exports. It will also scrap Article 370 of the Indian Constitution which grants special concessions to the disputed state of Kashmir. India’s 263 million farmers are a key voting bloc in the world’s largest democracy. The main opposition Congress Party has promised to write off farm loans through out the country. To match it, BJP committed to invest Rs 25 trillion ($359 billion) in rural development and said farmers will receive Rs 6,000 in income support. "The essence of the manifesto is to deplete poverty to single digits in next five years and then eventually eliminate it," Finance Minister Arun Jaitley. "This manifesto has been prepared with a strong nationalist vision." BJP, which is leading in opinion polls, is offering giveaways to stave off a challenge from Congress, led by Rahul Gandhi. Congress has promised in its manifesto to rid India of poverty by 2030 by providing income support to the poor, waiving farm loans and creating jobs. "With this document we are committed to moving toward a new India," said Rajnath Singh, Home Minister and head of BJP’s election manifesto committee. "We will work on improving India’s ranking in ease of doing business," Singh said. "We will try to double exports." The BJP is banking on the support of around 220 million Indians who have benefited directly from the government’s flagship programs, as well as a 750 billion rupees ($10.8 billion) income support program for small farmers and lower taxes for middle-class.